The pruning equipment professional PS100 lithium , for intensive pruning, are characterized by power and high speed cutting, precision servo control, low power consumption and robustness. Control of progressive cut in the cutting tool (scissors) from EQUIPMENT PRUNING allows a perfect position of the blade throughout the cutting cycle, thereby improving access to any stem or branch. Its special head mounted on bearings (Pat. ), Maintenance, adjustment or lubrication daily, ensures a precise and clean cut that favors an easier healing, preventing diseases. The ergonomics of the SCISSORS PRUNING has been taken care of, especially its grip SOFT AIR . Along with the housing design and orientation of your blade, better control over the scissors is obtained, reducing user effort by providing their work.Adapting to any hand size. 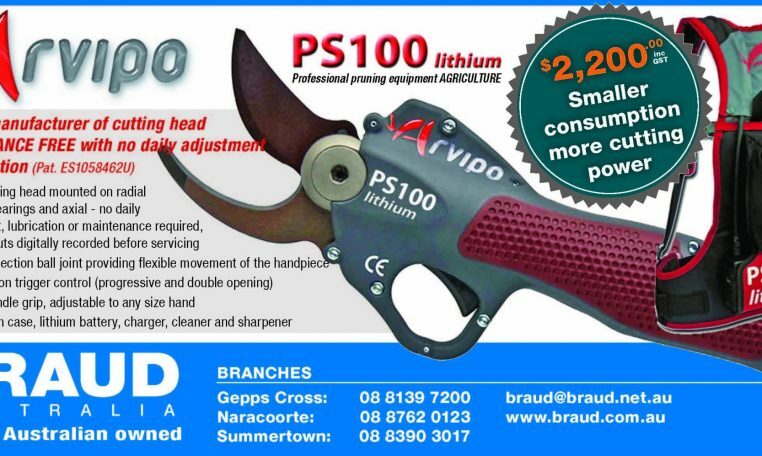 Electric pruning shears equipped with steel blade and counter-blade special AVP100 high wear resistance and nicking. Specially designed to suit all types of crops. (Vines , olive , orange , fruit , forestry , conifers , hardwoods , pruning urban and ornamental ) . Protractors ARVIPO EX-PS for exclusive use with the pruning shears ARVIPO PS100 / 60 . Comfortable, lightweight, balanced, adaptable to your needs pruning height. Made of aluminum 6080 T6 , incorporating a cleaner hook to facilitate the collection and cleaning up cut branches. Available in 3 sizes, 90 , 140 and 200 cm. - Cut Type: Progressive and double opening Autonomy: More than 8 hours * Up to 14 hours depending on the crop..